According to the National Institute of Health, approximately 20 million people in the United States suffer from some form of neuropathy. Neuropathy is a condition associated with damage to the peripheral nervous system. This damage may cause message interference with the body, brain and spinal cord, causing several unpleasant symptoms such as pain, tingling, numbness and many others that we will discuss later in this article. Whether you’re dealing with single nerve damage, such as carpal tunnel syndrome, or nerve group damage, the chiropractors at the Back and Neck Center of Brick, in Brick NJ can help. Lets gain a better understanding of the Peripheral Nervous System. Autonomic Nerves: Communicate messages for involuntary or automatic functions of the body. For example, heart beat, digestion, ect. Motor Nerves: Control the muscles that enable movement of body parts. The severity of symptoms can range from moderate to severe depending on the affected nerves and where they’re located. Some cases of neuropathy can be chronic causing constant pain, discomfort, and fatigue. Some cases are only triggered by poor posture, or exercise. Some symptoms may come and go randomly. Though extreme, some cases of neuropathy may cause loss of consciousness, breathing problems, and paralyzation, but most peripheral neuropathy symptoms present themselves in the following ways. If you’re living with neuropathy, your local chiropractor may be the best place to seek help. Chiropractors are nervous system specialists, and they can make sure that your body is running at optimum performance, so that your nervous system can successfully transmit messages. Your chiropractor may want to apply gentle adjustments to the area to help alleviate pressure from the affected nerve or nerve group. Patients may also experience relief when the chiropractor performs electro-stimulation therapy. Your chiropractor may also recommend Cold Laser therapy or other adjunct therapies if they feel they are required in your particular case. Since neuropathy can be chronic, your chiropractor may develop a schedule for regular visits, and as the condition is controlled, your frequency of visits may decrease. After your visit is complete, your doctor may recommend some diet and lifestyle choices to help assist in your recovery. We hope you found this article useful. If you, or anyone you know is living with neuropathy, the Back and Neck Center of Brick can help! Our chiropractors have been helping patients in Brick NJ for over 28 years, and we’re confident we can help you too. 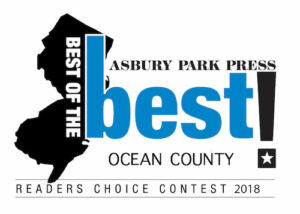 Come see why our Office has been Voted Best Chiropractors in Ocean County 9 times in a row! From 2009-2017, by Reader of the Asbury Park Press. Prev Previous post: Sacroiliac Joint Dysfunction and How your Chiropractor can Help.